Saturn's moon Titan, shown here in an artist rendering is loaded with liquid methane and shrouded by heavy clouds. Might it support life? New evidence raises the possibility, but scientists say it's more likely the findings involve non-biological processes. New findings have roused a great deal of hoopla over the possibility of life on Saturn's moon Titan, which some news reports have further hyped up as hints of extraterrestrials. However, scientists also caution that aliens might have nothing to do with these findings. All this excitement is rooted in analyses of chemical data returned by NASA's Cassini spacecraft. One study suggested that hydrogen was flowing down through Titan's atmosphere and disappearing at the surface. Astrobiologist Chris McKay at NASA Ames Research Center speculated this could be a tantalizing hint that hydrogen is getting consumed by life. "It's the obvious gas for life to consume on Titan, similar to the way we consume oxygen on Earth," McKay said. Another study investigating hydrocarbons on Titan's surface found a lack of acetylene, a compound that could be consumed as food by life that relies on liquid methane instead of liquid water to live. "If these signs do turn out to be a sign of life, it would be doubly exciting because it would represent a second form of life independent from water-based life on Earth," McKay said. However, NASA scientists caution that aliens might not be involved at all. "Scientific conservatism suggests that a biological explanation should be the last choice after all non-biological explanations are addressed," said Mark Allen, principal investigator with the NASA Astrobiology Institute Titan team. "We have a lot of work to do to rule out possible non-biological explanations. It is more likely that a chemical process, without biology, can explain these results." "Both results are still preliminary," McKay told SPACE.com. To date, methane-based life forms are only speculative, with McKay proposing a set of conditions necessary for these kinds of organisms on Titan in 2005. Scientists have not yet detected this form of life anywhere, although there are liquid-water-based microbes on Earth that thrive on methane or produce it as a waste product. 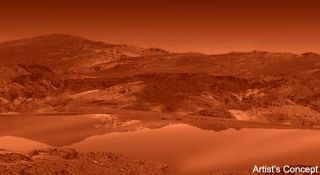 On Titan, where temperatures are around minus 290 degrees Fahrenheit (minus 179 degrees Celsius), any organisms would have to use a substance that is liquid as its medium for living processes. Water itself cannot do, because it is frozen solid on Titan's surface. The list of liquid candidates is very short -- liquid methane and related molecules such as ethane. Previous studies have found Titan to have lakes of liquid methane. The dearth of hydrogen Cassini detected is consistent with conditions that could produce methane-based life, but do not conclusively prove its existence, cautioned researcher Darrell Strobel, a Cassini interdisciplinary scientist based at Johns Hopkins University in Baltimore, Md., who authored the paper on hydrogen appearing online in the journal Icarus. Strobel looked at densities of hydrogen in different parts of the atmosphere and the surface. Previous models from scientists had predicted that hydrogen molecules, a byproduct of ultraviolet sunlight breaking apart acetylene and methane molecules in the upper atmosphere, should be distributed fairly evenly throughout the atmospheric layers. Strobel's computer simulations suggest a hydrogen flow down to the surface at a rate of about 10,000 trillion trillion molecules per second. Strobel said it is not likely that hydrogen is being stored in a cave or underground space on Titan. An unknown mineral could be acting as a catalyst on Titan's surface to help convert hydrogen molecules and acetylene back to methane. Although Allen commended Strobel, he noted "a more sophisticated model might be needed to look into what the flow of hydrogen is." Scientists had expected the sun's interactions with chemicals in the atmosphere to produce acetylene that falls down to coat the Titan surface. But Cassini mapped hydrocarbons on Titan's surface, it detected no acetylene on the surface, findings appearing online in the Journal of Geophysical Research. Instead of alien life on Titan, Allen said one possibility is that sunlight or cosmic rays are transforming the acetylene in icy aerosols in the atmosphere into more complex molecules that would fall to the ground with no acetylene signature. In addition, Cassini detected an absence of water ice on the Titan surface, but loads of benzene and another as-yet-unidentified material, which appears to be an organic compound. The researchers that a film of organic compounds are covering the water ice that makes up Titan's bedrock. This layer of hydrocarbons is at least a few millimeters to centimeters thick, but possibly much deeper in some places. "Titan's atmospheric chemistry is cranking out organic compounds that rain down on the surface so fast that even as streams of liquid methane and ethane at the surface wash the organics off, the ice gets quickly covered again," said Cassini team scientist Roger Clark based at the U.S. Geological Survey in Denver. "All that implies Titan is a dynamic place where organic chemistry is happening now." All this speculation "is jumping the gun, in my opinion," Allen said. "Typically in the search for the existence of life, one looks for the presence of evidence -- say, the methane seen in the atmosphere of Mars, which can't be made by normal photochemical processes," Allen added. "Here we're talking about absence of evidence rather than presence of evidence -- missing hydrogen and acetylene -- and often times there are many non-life processes that can explain why things are missing." These findings are "still a long way from evidence of life," McKay said. "But it could be interesting."